An unseasonably warm winter has created poor skiing conditions across Ontario as many ski resorts struggle to keep snow on the slopes. Several Ontario hills have set new records this year for the latest opening dates on record. If the weather conditions persist, 2015-2016 could be a historically short ski season in the region. The relatively balmy conditions have been attributed to El Nino, a weather system caused by a flow of warmer-than-usual surface waters from the Pacific Ocean. The phenomenon typically occurs every two to seven years and brings about warmer winds, rain and a generally shorter winter. For Ontario skiiers and snowboarders, it means less powder and more slush on the region’s downhill trails so far this year. 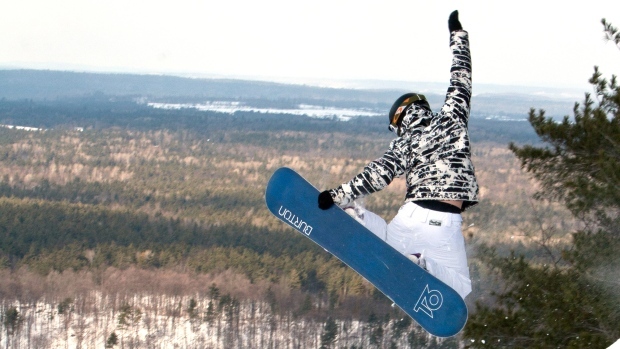 The slopes weren’t ready at Laurentian Ski Hill in North Bay, Ont., until Jan. 2 – the latest opening date on record, surpassing the former record of Dec. 30 in 2006. Plus-zero temperatures and a lack of snowfall pushed opening day past the holidays, a traditionally busy period that the resort relies on for business. “The Christmas period is key for every ski hill, and we had no money coming in at all,” said general manager Trish Pecore. It was a similar story 300 kilometres south at the Blue Mountain Ski Resort, where a mini-putt course, zip-lining trail and other summer activities were re-opened before Christmas. The resort’s snow-making team waited for frigid temperatures to arrive before firing up their snow-making machines. When it finally opened on Dec. 30, it was Blue Mountain’s latest opening day on record, surpassing the former record of Dec. 26 set in 2001. One of the earliest opening dates in Ontario was Dec. 5, at Hidden Valley Highlands Ski Area in Huntsville, Ont., where a temporary blast of wintery weather helped keep man-made snow on the trails. However, warm conditions and rain quickly followed, keeping the trails closed for more than three weeks afterwards. It was a drastic change from last season, when Hidden Valley opened on Nov. 29 and remained operational during the Christmas holidays. “Our numbers have been lower for sure,” said Courtney Payne, communications and event manager for Hidden Valley. She added that attendance has been doing “quite well” since the slopes re-opened on Dec. 28, with an estimated 300 to 400 skiers and snowboarders on the hill last weekend. As of Thursday, three of its 11 trails were open. Closer to Ottawa, Calabogie Peaks opened on Dec. 26, which was “certainly later than usual in the last six years,” according to marketing director Liz Murphy. However, Murphy said that the resort offered snow-shoeing, hiking and several all-season activities before opening day, adding that the resort’s hotel “has not been affected” by the temperate weather. Many hills prepare for opening day by stockpiling snow in large drifts, sometimes called “whales,” that are kept at the ready to blanket the slopes once optimal conditions arrive. But fluctuating conditions can make it difficult to build the snow reserves. This week in the Muskoka region, temperatures jumped from -30 on a Tuesday to 0 Thursday. From a nation-wide perspective, ski conditions in the east and west appear to have flip-flopped from last year. Castle Mountain, a resort in the Rockies near Pincher Creek, Alta., was forced to close in mid-February last year due to a lack of snow. In B.C., Mount Washington on Vancouver Island and Hemlock Valley Resort, about 120 kilometres east of Vancouver, also closed early. But the current season has seen plenty of fresh powder across the west, with big-ticket resorts such as Lake Louise and Sunshine Village opening in November. On the flip side, Ontario’s deep chill last winter meant good snow-making conditions throughout the season. Most Ontario ski resorts post their trail conditions online, with regular updates on how many are open and estimates of snow base depth. For now, skiers and snowboarders in the region can simply look to the sky and cross their fingers. “Hopefully everyone can do snow dances for us and the cold weather will come,” said Payne.